This week's been a happy one for some, and a really rough one for others. In fact, I felt so overwhelmed myself this week with trying to find a balance between life and rest (and then feeling like I've fallen behind some as a result), that I wasn't sure how I'd get this post together this week. Regardless of who voted for whom, the truth is that there are people hurting, and there are families and friends that have been pitted against each other and ripped apart. This election has really brought out the ugly in a lot of people. At the same time, I am seeing opportunity. We have become complacent, and this has reawakened within many people the desire to seek change, to make things better. So this post has bit of a theme to it. With this post, I hope to inspire you to see the diamonds within others as well as within yourselves, and use those gifts to make the change in your world that you'd like to see. This is for when you're feeling overwhelmed. It's for when you see hurt and suffering. It's for when you're in a situation where you feel powerless. Dig your heels in, pick yourself up, lift your head high and keep going. If this photo looks familiar (for those of you following my Facebook page), it's because I used it as my inspiration for one of the workshop wool paintings for next Saturday. Sweater weather is finally upon us, and with that here are some DIY sweater slippers you can make yourself if you have some experience with a sewing machine. Head on over to a thrift store and pick up a sweater in a pattern you like. Best of all, you have plenty to pick from, since you don't have to look just for sweaters in your size - so don't forget to check the juniors section as well! OR, you could get a plain sweater, needle felt some embellishments on top, and wet felt the back to make sure it's secure prior to sewing on the lining/bottom. I fell in love with the sound (which I like the edited studio version much better, it's easier to hear and they really get that interesting off sound that's hard to replicate live). Like it or not, I find the meaning behind the song interesting, especially with what's going on with the current Native American protests, and some of the stuff going on. Having grown up in the deep south, though in Tennessee not Texas, I can definitely relate. I'm always looking for various way to apply felt, and making lamps is one of those. 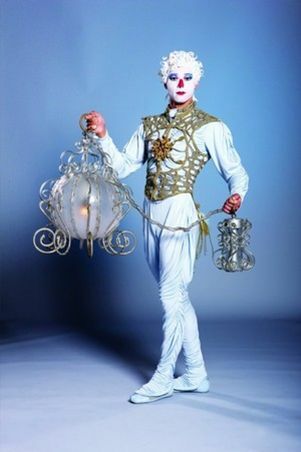 One of these days I want to recreate the Cinderella's-coach-looking lamps from Cirque du Soleil's Allegria (this one), something I sketched out years ago and I'm thinking I could do that with felt. I am in love with Leonard Afremov's oil paintings, and one of these days I'll buy one of them for myself (or maybe request as a gift). He is not afraid to use bright, bold, beautiful colors in his paintings, and they really just seem to sparkle. I was so tempted to do a study of one of these in felt (and to do that for my workshops on the 19th), but I really need to spend some more time studying his art and actually do it myself before we do an Afremov study. It'll be easier to do once we start doing series of workshops that tie into each other, like a series of artist studies in felt. A beautiful film out of Ireland with an illustration style similar to that of Song of the Sea (which I shared a few weeks ago). This movie is full of so much symbolism, you may have to watch it a few times to get it all - I've seen it twice and I still think I need to watch it a few more times myself. You may also start to see a connection between this post's theme and the movie. This is a wonderful TED talk on using our passions and talents to create something meaningful with our lives. Definitely a must-watch! Have you ever heard or read the story Acres of Diamonds? If not, I highly recommend reading it (or just watch this video). It's an old one, and has been retold thousands of times, a few words changed here and there, the context changed but the story is always the same. A man is either told or hears of people who have made millions by prospecting for diamonds, so sells everything he owns including his land (in the story the man is typically already wealthy and has a family and more than enough to live a happy, fulfilling life) to go out and search for diamonds. Meanwhile the person he sold his land to finds that it was a diamond field. Instead of looking at what others have, or searching for greener pastures, look for the wealth you already have in your life. This has been the first week of an 8 week challenge I joined called Momentum17 and led by this amazing woman, Jennifer Kem. In order to grow a business, if you want to be successful you should look for anything and anyone that might help you learn and challenge you to do better. Always be learning. Also realize that no one single individual has ALL the answers to your questions. They all come from different backgrounds, they've all used different strategies to get to where they are, and you should do the same. If you want to be successful, watch what other successful people are doing, apply it to your life, keep what works and toss what doesn't. Eventually you'll come up with your own list of things that helped you become successful. Just realize you don't have to start from scratch, some people have learned a lot of lessons the hard way and are generous enough to share those lessons with you. Look for the diamonds that other people are openly sharing with you. If you find that Jennifer Kem's content inspires you, please sign up for her mailing list and join her 8 week challenge on the Paid To Be You Posse group on Facebook. We're only one week in, and she livestreams every day, so you can easily catch up. Best of all, this challenge is free!